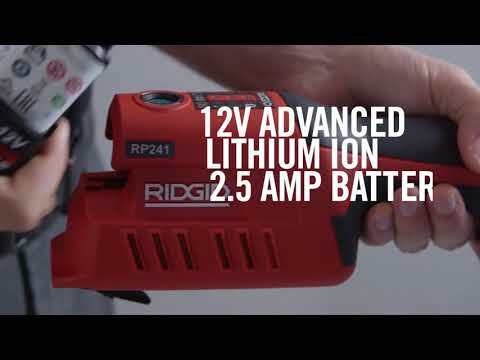 The RP 241 is the latest tool in the RIDGID Compact Press Tool family. 25% smaller and 10% lighter than its predecessor, this lightweight, low profile design, is ergonomically designed to help you easily work overhead and in tight spaces. Smaller tool - The RP 241 tool is 25% smaller and 10% lighter than the previous RIDGID Compact inline tools. Better Weight Balance - While the tool is ~1 lb (0.5kg) lighter than its predecessor, with a better balance of weight, the tool will feel even lighter than that. Multiple Size & System - Multiple Size & System - RIDGID compact press tools go up to 1 1/4" (35 mm) on Copper & Stainless Steel; up to 1 1/2" (32 mm) on PEX tubing; and up to 3/4" (20mm) Iron Pipe. Bluetooth Connectivity - Connect to your tool through your phone and manage important information like cycle count and battery life. New 12V Lithium-Ion Battery - Every RP 241 Kit includes two 12V Advanced Lithium Ion Batteries, each providing more than 140 crimps* per charge. *Over 150 crimps per charge on 1-1/4” (22mm) copper fittings—smaller sizes may get more crimps. Introducing RIDGID Link™, a new mobile platform that interfaces with RIDGID® tools equipped with Bluetooth technology. Registration is quick and easy and the app provides valuable real-time data on your phone or tablet. Sign up today to start working faster…and smarter..
RIDGID is the trademark of Emerson Electric Co. or its affiliates and is registered in the U.S. and elsewhere. All third-party trademarks are those of their respective owners. Steel Capacity (North America) 1/2" - 3/4"
Lighting Large LED-light for no or low-light environments. Charge 140+ crimps per charge. Model Design Inline design to help access tight spaces. RP 241 Press Tool is rated 4.9 out of 5 by 23. Rated 5 out of 5 by Mikej12 from Bluetooth I absolutely love this press tool.. have to say feels and woks best out of my other press tool I have the Nibco and milwaukee press tool. Rated 5 out of 5 by streitsmaintenance from great small compact design great tool. small compact design that allows me to get into smaller spaces. also has a rotating head which I thought was awesome. Rated 5 out of 5 by FireTruck12 from This product is a game changer in the plumbing world. Absolutely the best tool money can buy. While it is a large expense, the time savings in work will allow the individual to be more productive. This is my first Ridgid electric tool purchase and I am very pleased with its performance. Typically Milwaukee Tool is my go to brand of cordless tools but with the versatility of the jaw sets from one tool, there was no comparison. Waited over 6 weeks for this tool to be delivered to my vendor, but it hasn't let me down. I opted to purchase the F1807 jaw sets to allow me to crimp Pex B tubing/pipe as well as pressing copper fittings. The electronics in the tool allow for accurate presses/crimps every cycle and with RidgidLink it keeps a log of the number of presses and when the tool should be serviced. Very happy with this purchase. Rated 4 out of 5 by GoodInc from This one of many great Ridgid Pro Press guns we own This tool just adds to our collection (7) of pro press guns, very compact and easy to use. Access with this style tool is fantastic. Only pain was physically trying to get it. Had to wait a long time for delivery. Rated 5 out of 5 by Jbeaup25 from Works great, I wish the prices of copper fittings were a bit cheaper! Very happy with the products performance. The price of copper fittings will take some getting used to. I can see me saving a lot of time and labor with this tool. Rated 5 out of 5 by DanGaynor from Great tool use it everyday Easy to use and very well designed, awesome battery life, compact body. Rated 5 out of 5 by TrainerDave from Overall Reliable Tool for Smaller jobs The Tool and Link connection feature is great, with the highlight being the local recalibration locations listed! Absolutely. This tool with the F1807 jaw sets for the pex pipe you will be crimping works great. Easily allows you to switch systems while utilizing the same tool. Is there a 1-1/2&quot; compact pro press copper jaw for the 200-B tool ? I am sorry, there is not a 1 1/2&quot; jaw for copper that works on our compact models such as the RP 200-B. The RP 340 Press Tool has a range of 1/2&quot; - 4&quot; with the appropriate jaws and/or rings. 240/241 it's the same jaws as the 210B/200B? Thanks for writing to us! Yes - the new RP 240 and RP 241 use the same Compact Press Jaws are our previous RP 210-B and RP 200-B.